The weather in the upper Midwest has been particularly sporadic this year, bouncing back and forth between winter and summer temperatures. Mother Nature's indecision weighs heavily over us, as the forecast rises and plummets to her whims. I wore a heavy winter coat to an amusement park for the first time earlier this week. This field trip was planned nearly a month ago, when April weather was coming out of its winter slump. Surely it will be warm at the end of May, I thought. Maybe I should pack sunscreen, just in case. I was so very wrong. With summer vacation only a week away, I hope Mother Nature gets her forecast in order. I have some sunbathing I need to do. Late spring is easily my least favorite for produce. Summer has fresh berries and vegetables straight from the vine. Along with a lasting scent of cinnamon, autumn brings an abundance of crisp apples and pumpkin. Winter delivers citrus and pears to accompany bowls of hearty stews. Spring, however, appears to have nothing at all. Living as far north as I do, growing season has not arrived. The rhubarb is now awakening from its long nap, the strawberry plants have just been buried in the dirt, and so we must wait. Frozen produce has become my salvation until the garden blooms. Pie has been on repeat in my mind lately. Pie, pie, pie. I made three of them in the last week alone. More than anything else, I think I just wanted to play with the dough, to shape it in new ways, to go through the motions of creating something beautiful and delicious. Though, having a slice here or there hasn't been a negative either. With this particular pie, frozen berries are easier to use than fresh. Frozen berries have a consistent level of sweetness and, when thawed, release the right amount of juice to set into the perfect pie. To accompany the berry flavor, I used a couple tablespoons of balsamic vinegar. 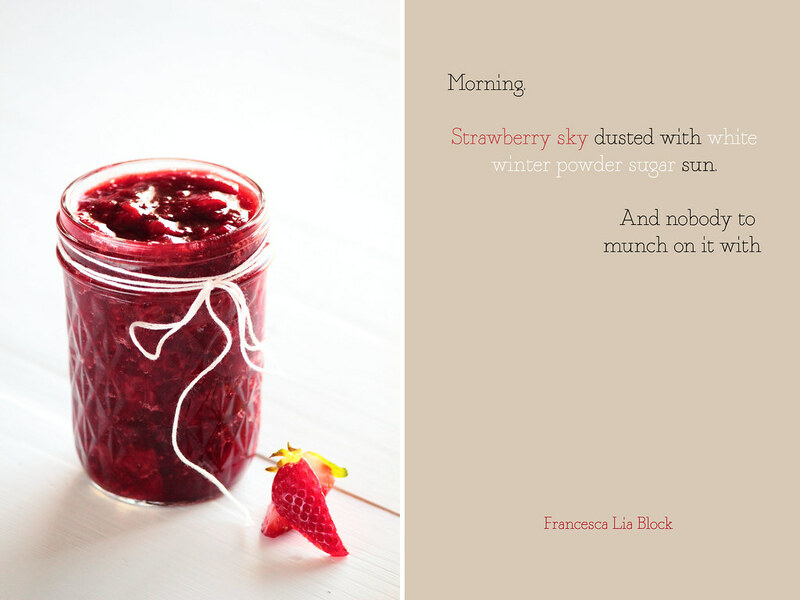 Strawberry and balsamic flavors are notoriously complementary and I find this effect carries over to berries as well. The balsamic flavor is faint (it is difficult to taste unless you are aware it is present), but it adds something special that the plain berries would not have otherwise. Berry Balsamic Pie comes together quite easily. Since it uses frozen berries instead of fresh, the filling can be mixed together quickly. A little balsamic vinegar helps to round out the berries flavor. I used a combination of strawberries, raspberries, blueberries, and blackberries for this pie. If preferred, the lattice top is not necessary, so you could save yourself a bit of time if you are on a tight schedule. However, I prefer a little extra pie crust with my berries and—I imagine that you do too—so I have suggested it is included. Serve plain, with fresh whipped cream, or a side of vanilla ice cream. In a large mixing bowl, gently stir together the thawed berries, sugar, flour, and balsamic vinegar until the berries are evenly coated. Set aside. Form the pie dough into a disk and divide it into a 60/40 ratio (if using store-bought crust, do not worry about this step). On a lightly floured surface, roll out the larger section of dough into a 14-inch round circle. Carefully transfer it to a 9-inch pie pan and trim the excess pie dough to create a 1-inch overhang. Tuck the dough overhang under itself and pinch the dough between your thumb and forefinger to make a decorative edge around the rim. Fill the pie crust with the berry mixture. On a lightly floured surface, roll out the smaller section of pie dough. Using a pizza cutter and a ruler, cut out 3/4-inch wide strips of dough. Layer the strips over the top of the pie in a decorative fashion. Trim and tuck the edges of the strips into the pie mixture itself. Using a pastry brush, brush the top of the pie with milk and sprinkle granulated sugar over the crust. Bake the pie for 15 minutes. Then, lower the oven temperature to 375 degrees F (190 degrees C) and continue baking. Cover the edges of the pie crust with aluminum foil to prevent further browning. Bake an additional 50-65 minutes, or until the lattice and crust are evenly browned. At the ripe age of twenty-three, I fear I'm becoming an old woman. It's a silly fear, I know. I'm not afraid of growing older (we all must go through it eventually), but I am afraid of skipping my thirties and forties and jumping straight into my sixties. Over the last couple years, my habits have begun to betray me. I can't remember the last time I went out on a Friday night; and when I did, I was certain to be home before the strike of ten. My mother and I enjoy watching Hot in Cleveland together (and I find myself laughing louder and longer than her). I ask for kitchen appliances and dishware when the holidays roll around. I often wear vintage clothes and, to my dismay, more than once my students have loudly proclaimed I dress like an old lady (you have the same shoes as my grandmother!). I suppose, in many ways, you could say I am already channeling the spirit of a seventy-five year old woman. Maybe I wouldn't fear becoming an old woman if The Signs hadn't already arrived. As I sat down in the optometrist office last month, my eye doctor broke the news that my eyes were already getting cataracts. I have exactly three old lady veins—two in rather inconspicuous locations—but the last has the unfortunate position of running down the entire length of my nose (which my boyfriend so lovingly pointed out "looks bluer when I'm cold"). And, to spread the icing on the cake, I recently discovered I have laugh lines while tiredly looking at myself in the mirror. I even talk like an old woman. Just the other night I caught myself telling my mother that I wished pants weren't so low cut and I hoped I could find a pair with a higher waist. It's like a disease, I tell you. Old womanitis. Despite my frivolous concerns towards aging, when I stumbled upon the quote above by Cassandra Clare, I did feel more at ease about myself. 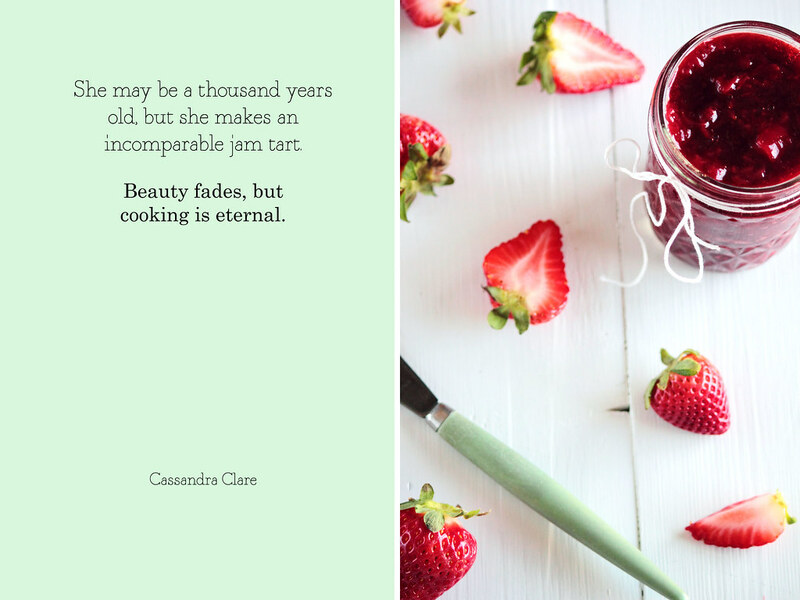 Beauty may fade, but cooking is forever. It's comforting to know that it doesn't matter whether my hair is gray or my hands are gnarled; I can make a mean chocolate chip cookie. In the end, I think that's what matters most. Food brings people together—it's a celebration of life and love. When it comes down to it, I'd rather my legacy be lovely strawberry jam instead of a history of face lifts. 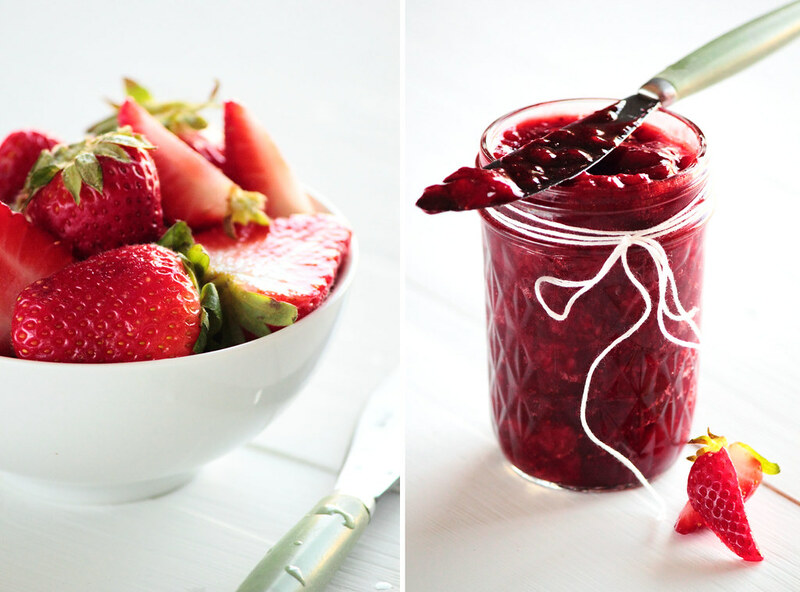 This strawberry jam is thick and sweet. Balsamic vinegar joins strawberries, lending a unique and enhancing flavor. 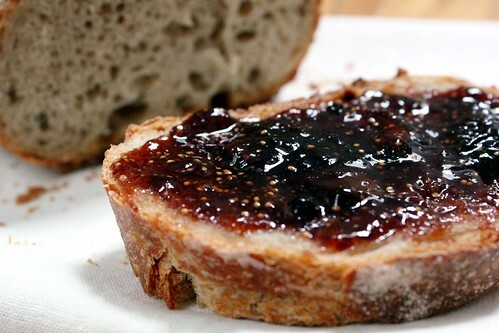 The jam is thickened on the stove top until it reaches your desired consistency. 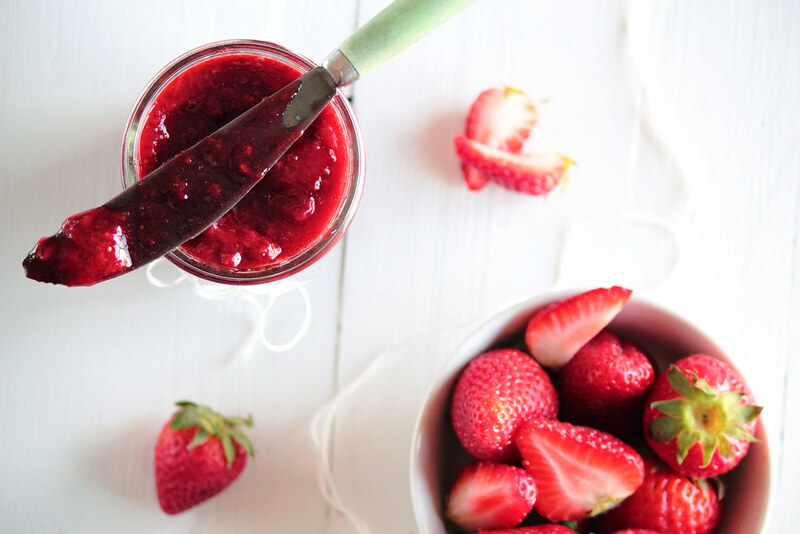 This strawberry jam is perfect to spread on bread, crackers, or drizzle on top of ice cream. The fig and I have an on-again off-again relationship. He is an unassuming, dumpy little gentleman if I ever saw one. At least that's what I thought until he got up the nerve to flash me. The audacity! I just can't look at him the same anymore--not after being exposed to all that eye candy. Our love affair was brief. He took me for brunch and we dined on pancakes. He treated me to decadent desserts (and oh he can be so sweet-tempered smothered in chocolate). Then things headed south. He got cloying, sugar-coating all his words. More than once he got just a little too ripe with me. I was at fault too. I was fickle. He caught me checking out the pears in the grocery aisle. I brushed him off to spend quality time with the apples. But we can never stray from each other for long. He always finds his way back to my kitchen table. 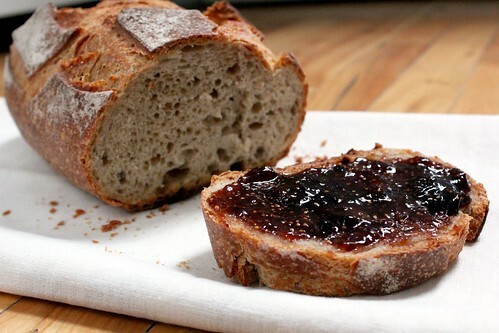 I will admit I was wary of making this jam. Figs and balsamic? Peppercorns? I couldn't imagine the taste, which made me suspicious. Thankfully, my curiosity got the better of me and I gave it a try. Oh, I am so glad I did. Figs and balsamic are like a match made in heaven. 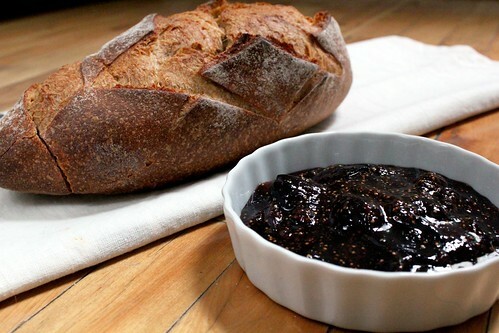 With jams, I generally get concerned that the sugar will overtake the jam and drown out the flavors, but with this one the peppercorns and lemon juice really keep that in check (and add a nice kick too!). 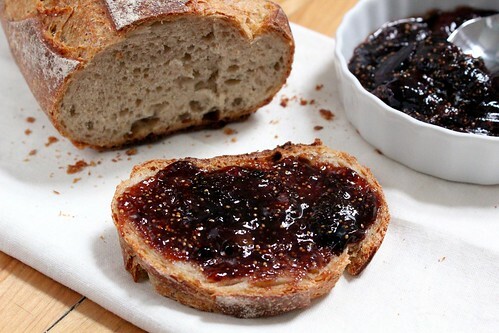 If you are wary of this fig and balsamic jam like I was, you are going to miss out on a uniquely delicious flavor combination.